I’m spending this beautiful day inside because of the above-pictured jug aka Jug O’ Urine. 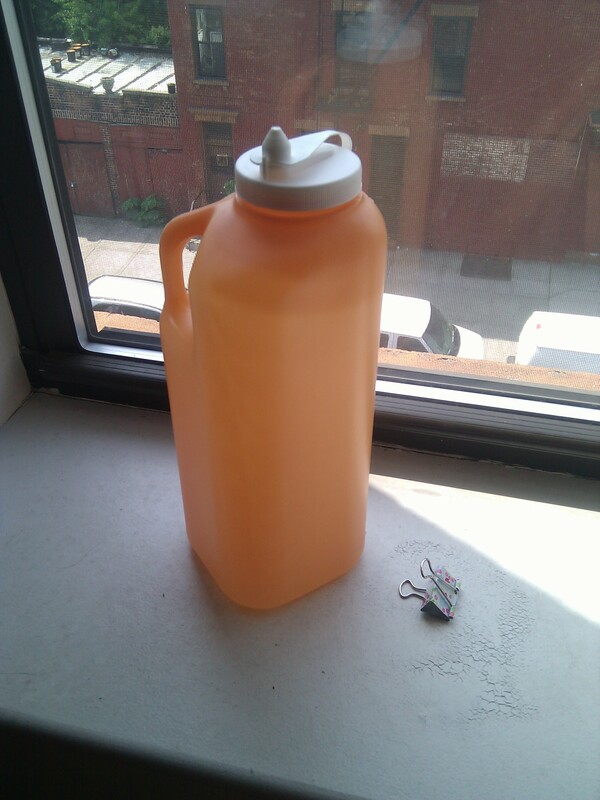 This beautiful orange jug is for me to collect my urine for 24 hours. Whoever created this jug is genius, the orange color masks the urine color, which would make this whole process even grosser. And believe me, it’s gross. I’ll never look at a plastic Dixie cup (my urine collector) the same again. This jug is now sitting in my fridge (Yes, it has to be refrigerated!) next to my Brita water filter and half-gallon of milk. It just keeps getting worse, right? You’d think that because this was my second time doing this test (it’s for monitoring my kidneys, to see if there’s an increased amount of protein in urine) that I’d be less grossed out. I don’t have to fill the jug, but I take it as a challenge to make sure I’m drinking lots of water. Last time I filled it 2/3 of the way…here’s to a jug half-full.